There’s nothing like coming home at the end of a long day and building a fire in the fireplace inside of your house. It can create a relaxing environment for you and your family and keep your home warm in the wintertime. Nevertheless, if you plan on using the fireplace in your home on a regular basis, you need to have your chimney inspected and maintained properly every year. It could prevent a catastrophe from taking place. Here are three reasons you need to have your chimney inspected. A chimney inspection can prevent a chimney fire from taking place. Over time, the inside of your chimney can get clogged up with creosote, a substance that looks a lot like tar and is a byproduct of burning pieces of wood in a fireplace. If this creosote builds up enough, it can actually catch on fire and produce a chimney fire that you may not even detect until it’s too late. Chimney fires can cause damage to the walls of a home and the roof, and if you don’t catch them in time, they can even burn down your entire home. 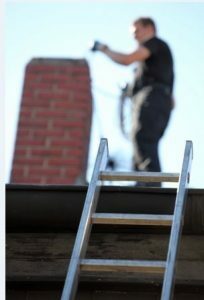 A chimney inspector will be able to detect the buildup of creosote and do something about it. A chimney inspection can keep carbon monoxide out of your home. If your chimney is clogged up with creosote or the flue inside of your chimney isn’t working properly, the carbon monoxide that is created when you start a fire won’t have any way to get out of your home. Therefore, it will often build up inside of your house, and it can cause serious illnesses and sometimes even death. Thousands of people die due to carbon monoxide poisoning every year, and many of those deaths are tied to chimneys. It’s why you should have your chimney inspected before using your fireplace regularly. A chimney inspection can stop smoke from doing damage to your fireplace. In addition to putting your family at risk for a fire or carbon monoxide poisoning, a malfunctioning chimney can also cause smoke damage to your fireplace. A chimney that is backed up with creosote and soot will often send smoke back into a home. This smoke can damage the front of your fireplace as well as any furniture and carpeting surrounding your fireplace. It can result in a big mess inside of your house. All of these chimney issues can be very serious. Fortunately, you can prevent them easily by having a chimney inspection done. Roofing by Bruce can inspect your chimney for you, clean it, and perform any repairs that need to be completed. Call us at 570-424-7250 today to set up a chimney inspection.